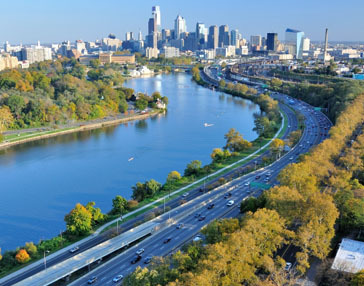 Philadelphia Activity-based Model Development | Resource Systems Group, Inc.
RSG is leading a team to develop an activity-based model for the Delaware Valley Regional Planning Commission (DVRPC) in Philadelphia with John Bowman and PTV Group. Our approach for this project is to transfer the DaySim model structure and software to DVRPC and integrate it with the VISUM implementations of transit assignment, highway assignment, and auxiliary models of freight trips, external trips, and special generators. We are working closely with PTV to maintain innovative features of the existing model system, such as schedule-based transit assignment. New models will be estimated from the recently completed DVRPC household travel survey collected in 2012-2013. This model synthesizes travel behavior for 5.6 million people in the Philadelphia region at a Census block level. The second phase of the project involves calibrating and validating the integrated activity-based travel demand to observed travel volumes, and providing training and support for DVRPC staff to use the model.